Recently part of the Greenside Recreational crew headed down to Tacoma to visit one of our favorite growers, Noble Farms. Once inside, it became clear the good people at Noble Farms take growing very, very seriously. Their state-of-the-art facility was designed to showcase how they grow their premium product. First we were shown their mothers room, which we were able to view through a window. Above are their mother plants beautifully displayed. You’re probably familiar with some of their most popular strains. Their Blackberry Headband is my personal favorite. 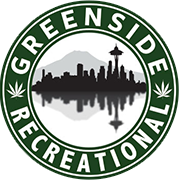 Here the Greenside Rec team is taking the opportunity to film one of the grow rooms. Greenside’s marketing director and resident Cannabis Nerd, Rik. Some of their Blackberry Headband. Master grower Mark, showing us their drying rooms. Mark, showing off some of their fatty buds! This is what heaven looks like… and you know it!